Spynie Palace, or Spynie Castle as it is also known, is two miles north of Elgin in Moray. Far from grand and palatial, what remains is David's Tower, a square keep with a high curtain wall, and the ruins of several other buildings. There are some interesting highlights including the ruins of the Great Hall, castle well, Watergate, gun portals, the crests on the walls and great views from the top of David's Tower. For five hundred years Spynie Palace was one of the fortified residences of the Bishops of Moray. The ruins are on the banks of Spynie Loch, once the site of a thriving mediaeval settlement. It remains one of the largest surviving bishop's houses in Scotland. Spynie Palace was originally built in the late 12th century, close to the site of the first Cathedral Church in Moray, now the churchyard of Spynie Church. Although the Bishop's Seat of Moray was transferred to the Holy Trinity Church at Elgin in 1224, the episcopal palace at Spynie remained the bishop's residence. Excavations in 1986 and 1994 revealed a great deal about this historic site. The first building would have been a wooden structure, probably containing a hall, chapel and bedchamber along with a bakehouse and brewery. By the 13th century, according to records held in the British Museum, the buildings had been replaced with stone buildings including a chapel with coloured glass windows. The East Wall was the main gate and had a strong portcullis for defence. By the 14th century the castle had been built, almost square, with a 23 foot high curtain wall. The main entrance faced south and an adjoining tower had arrow-slit windows. David's Tower, along with further accommodation, was built later by Bishop David Stewart in the 1470s and was the largest of all the mediaeval tower houses. It was built of sandstone and covered in render. It is five storeys high with a garret on top. Visitors can still see the round dungeon with its domed ceiling, the remains of a former round tower. The ground floor has a large hall with windows and stone seats. A spiral staircase gives access to the higher levels, each being a large room with smaller rooms off it. The original hall was used as kitchens. A walled garden was established with an orchard and the residents had meat from the doocote (pigeon house) and rabbit warren. 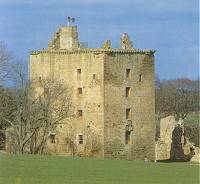 Spynie Castle had several royal guests including James IV in 1493, Mary Queen of Scots in 1562 and James VI in 1589. After a siege in 1640 King Charles I passed the castle from Bishop Guthrie, who was imprisoned, to the Earl of Moray. The last bishop to live at the palace was in 1688. The ensuing political uncertainty and conflict led to the decline of the palace and it fell into disrepair. The site was given to Historic Scotland in 1973 who continue to maintain this historic building. Spynie Palace is said to be haunted by a phantom piper and some visitors say they find the atmosphere eerie. Two miles north of Elgin, off the A941.